SIBOLAN S12 13.3 inch 1080p HDR Portable Monitor with HD Input Build in Speakers - BLACK US PLUG (2-PIN) w cenie $168.99 | Chińskie kupony rabatowe, zniżki i okazje! SIBOLAN S12 13.3 inch 1080p HDR Portable Monitor with HD Input Build in Speakers – BLACK US PLUG (2-PIN)! Teraz w promocyjnej cenie $168.99 Cena regularna to: $180.99, zaoszczędź i skorzystaj z kuponu na gearbest! Enjoy the PlayStation 4 experience anywhere with this sleek and high-quality Full HD 1080P monitor .SIBOLAN S12 13.3 inch is the latest model with the highest resolution in the portable monitor series. This monitor adaptor international well-know brand LCD panel, Anti-Glare surface,has 1920×1080 resolution;IPS display mode;350cd/m2 Brightness; True Color display for stunning color precision (16.7M(8-bit),72% colors)and a view angle of 85 degrees makes it perfect for two people to view the screen together. The Aluminium Alloy housing makes this products more extraordinary and Luxury. S12 is suitable for gamers who require a high resolution and display and for users who need a portable monitor for Mac Books or for Mac Mini that offers exceptional screen performance. S12 is compatible with game consoles such as PS4/PS3/ xbox one /xbox360,PCs, for Macs, laptops,cameras, tablets, smart phones…etc.with connectivity of Headphone output, Dual – Mini HD input port,Type-C Port;and 2W speakers;In addition, SIBOLAN S12 weighs only 0.56kg and is 8.5mm thick,Ultra Slim! Its compact size allows it to be easily put slipped into laptop bags or backpacks for a business trip or a vacation.Perfect for entertainment on the go! Watch picture perfect quality stunning 1080p images in Pure HDR. With SIBOLAN’s Pure HDR decoding technology, you can experience the best picture in pure color with 1080p upscaling that maximizes brightness and vivid colors. For users that want another monitor as a dual screen for better productivity, SIBOLAN S12 is compatible with for PS4/PS3/PS2/ xbox one/xbox360,game consoles,PCs,for Macs, laptops, cameras, tablets, smart phones…etc. It offers Headphone output, Dual – Mini HD input port,Type-C Port. Change different settings on the monitor to suit your preferences including the color effect (standard, game, movie, photo, and vivid mode). Pack XboxOne or PS4 together with the portable monitor and play your favorite games on a vacation. 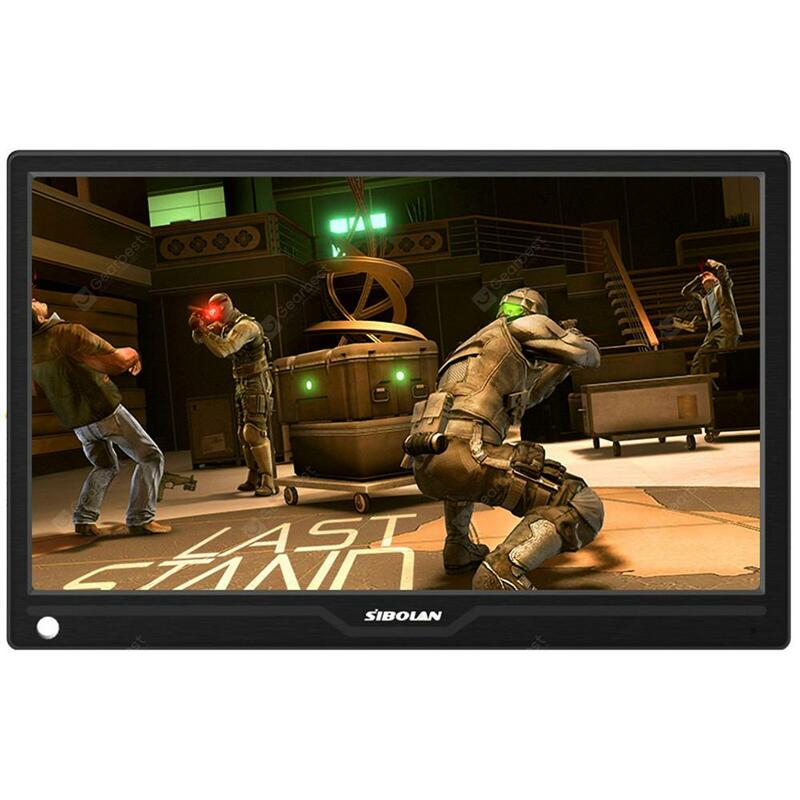 With no lags guaranteed, the monitor has 1920×1080 resolution and True Color and offers high quality images and a great gaming experience. With multiple connectivity options, S12 supports HD input, perfect for game consoles. Is the lag on your gaming system killing you? SIBOLAN customers expect virtually lag free gaming experiences with quality sound and a unique ability to safely and conveniently game anywhere. We designed the S12 Professional Gaming Monitor with all of these expectations in mind.So stop sacrificing your lives and your standards and start playing smarter. Use a second monitor as a bigger screen to review pictures/videos from the camera when outside the studio. Only a monitor that delivers stunning color clarity with 1920*1080 resolution and True Color can actually display high quality photos and videos. Work as second Display for business man;Work with Wifi display dongle for wireless share with your mobile phone;Work with Android TV dongle or box to use as a TV; Work as security and safe monitor; Work as monitor for medical facilities;Work as monitor for director…. Note,additional adapters may be needed to connect your various devices to the monitor. 2. How do I connect my PS4/XBOXone/Cameral/PC/ MID/Mac book with your portable monitor? For all connections to PS4/Xbox One/ Cam ect.., a HD cable will be needed( In the box). 3. What kind of HD port does this monitor have? 4. Can I connect two device with your monitor at the same time ?